SOLIDWORKS 2017 coming soon… Top things to consider before upgrading. The twenty-fifth edition of SOLIDWORKS in currently in beta with some great things coming, but we aren’t going to talk about that just yet. With every version, there are things that we should take into consideration before pulling the trigger on the next version. The Following is a list that we will be adding to as other techs chime in. Are your video cards and drivers ready? Many instabilities are when going to a new version are caused by video errors. Be it driver or hardware related, having a certified card with driver tested for that version or new is very crucial. If things like inserting components, creating drawing views, and loading parts with high levels of graphics tessellation, cause crashing it more likely video related. If you are concerned with overall performance due to that video card please refer to this article written by our very own, Josh Altergott on the SOLIDWORKS blog. Do you have a clean area to install your newest version? Just look at the screenshot below. I hate to admit to it but is from my computer. 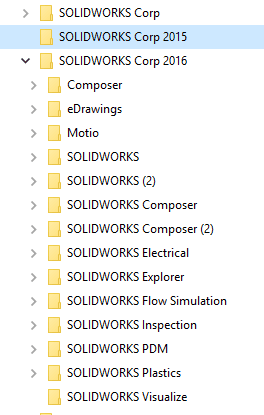 When I shall an SOLIDWORKS and a SOLIDWORKS(2) folder on my driver I about,… long pause. Well, let’s just say I wasn’t happy. It’s my fault, I’ll clean that up. You need to clean up the mess on your drives as well. Having orphaned and duplicated folders can cause a nightmare for DLLs to fire up correctly. Having a clean folder structure is very important to a good stable running SOLIDWORKS. That may explain why I crashed three times on Friday. Also, another big part of cleaning your room is the windows registry. 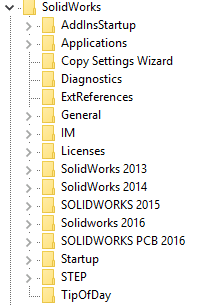 Feel free to point and laugh at my directory for my current install of SOLIDWORKS 2016. I also have 2015 and 2014 on there too. But, having old reg keys can cause some… let’s say unwanted or undesirable results sometimes. Looking for templates in the wrong location, using incorrect default settings, and possibly wrong DLLs may be loaded. This is not good at all. My suggestion is to delete all the old keys in the following key set, HKEY_CURRENT_USER\SOFTWARE\SolidWorks. If you are running SOLIDWORKS 2015, why have keys from 2011 and 2010 on your computer? As we continue working toward the commercial rollout of SOLIDWORKS 2017, we will touch on more of these preparations. We hope you enjoy.